"You didn't tell me you were going to kill it!" Happy Halloween! To help us get into the Halloween spirit (which gets harder every year as the Christmas stuff comes out a little earlier), we made caramel apple and carved our pumpkins while we watched, "It's the Great Pumpkin Charlie Brown". 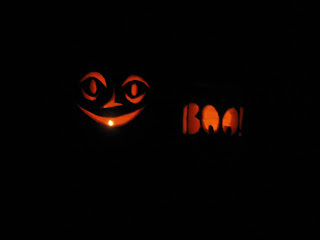 Since I still haven't been able to master the typical Jack -O-Lantern face with triangle eyes and a goofy smile, I printed off a stencil I found online. I thought my Boo! turned out ok (for me!). 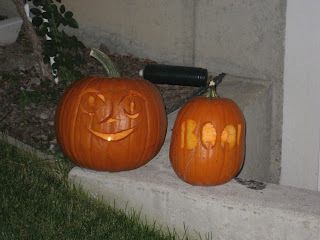 Reed found the face stencil and really did an awesome job (his pumpkins are always way better than mine). Our caramel apples struggled a tiny bit. 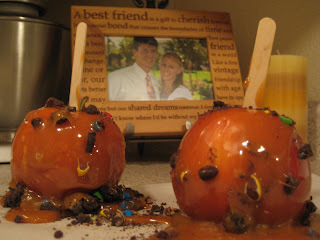 I think the caramel was too hot when we dipped the apples because it didn't really stick to the apples very well! But it was fun to add crushed up M&Ms and Oreo cookies (but the best part was definitely scraping off and eating the extra caramel on the wax paper!). We are so excited that Penny Grace was born on October 11! She weighed 6 lbs 12 oz and was 19.5 inches long. Congrats to Carrie and Todd and the new big sister, Stella! We love you guys and are so excited for another cute baby! Last weekend the volleyball team hiked Timp. They met at the school at 5am and got back around 2pm. Reed made it to the top in about 3.5 hours and brought home these gorgeous pictures! Could they have picked a better fall day?